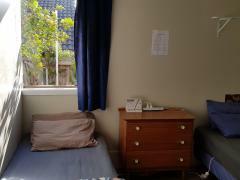 A lovely comfortable, double room for 1 person in a 3 bedroom house. Nice outside area for summer relaxation too. The neighbourhood is safe and 5 min walk to buses. Probably a 20 minute walk to train station and 10 min to local shops. It is within walking distance to MIT and AUT.